In this unregulated, pioneer land western companies bribe the government and suffocate dissent allowing them to cut endless corners and operate as cheaply as possible. By their sick algebra the most profitable means of extracting the black gold is simply to burn the accompanying gas (a scarce and valuable resource) off in flares (definition below). 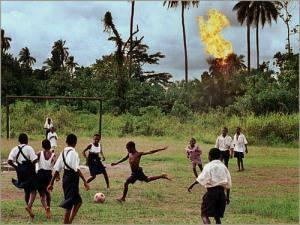 In Nigeria there are flares that have been burning continuously since 1972. You don’t need a degree in atmospheric or environmental science to know that deep down this is just wrong. All this goes to show without a shadow of a doubt that we do not face a choice. The questions have already answered and it is a no-brainer. Two roads bifurcate in front of us. One leads to a sustainable future in which we shift rapidly away from fossil fuels; live more locally; work fewer hours; shift our attentions from consumption to creativity; from competition to cooperation and provide space for the natural world to recover and evolve. This way of life is not mysterious. It is not fanciful. It is not utopian. It is practical and people are already doing it. Transition Towns show how to implement an ‘energy decent plan’ and check this new report from the Centre from Alternative Technology and NEF outlines a zero-carbon vision of the UK within 20 years. The other road leads straight to hell. People of earth… the choice is yours. Gas flare definition (source: wikipedia) A gas flare, alternatively known as a flare stack, is an elevated vertical conveyance found accompanying the presence of oil and gas wells, rigs, refineries, chemical plants, natural gas plants, and landfills. They are used to eliminate waste gas which is otherwise not feasible to use or transport. They also act as safety systems for non-waste gas and is released via pressure relief valve when needed to ease the strain on equipment. They protect gas processing equipments from being overpressured. Also in case of an emergency situation, the flare system helps burn out the total reserve gas. 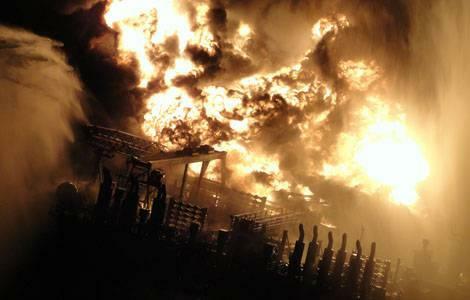 Flaring and venting of natural gas from oil & gas wells is a significant source of greenhouse gas emissions. Its contribution to greenhouse gases has declined by three-quarters in absolute terms since a peak in the 1970s of approximately 110 million metric tons/year and now accounts for 0.5% of all anthropogenic carbon dioxide emissions. The World Bank estimates that over 150 billion cubic metres of natural gas are flared or vented annually, an amount worth approximately 30.6 billion dollars, equivalent to 25 percent of the United States’ gas consumption or 30 percent of the European Union’s gas consumption per year. 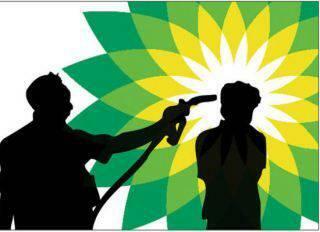 This flaring is highly concentrated: 10 countries account for 75% of emissions, and twenty for 90%. 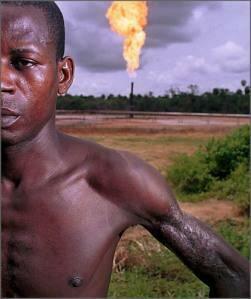 The largest flaring operations occur in the Niger Delta region of Nigeria. The leading contributors to gas flaring are (in declining order): Nigeria, Russia, Iran, Algeria, Mexico, Venezuela, Indonesia, and the United States. 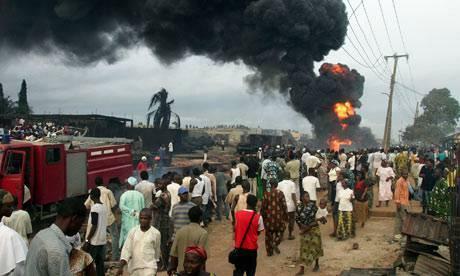 In spite of a ruling by the Federal High Court of Nigeria (that forbade flaring) in 2005, 43% of the gas retrieval was still being flared in 2006. It will be prohibited by law as of 2008. [_citation needed_]Russia has announced it will stop the practice of gas flaring as stated by deputy prime minister Sergei Ivanov on Wednesday September 19, 2007. This step was, at least in part, a response to a recent report by the National Oceanic and Atmospheric Administration (NOAA) that concluded Russia’s previous numbers may have been underestimated. The report, which used night time light pollution satellite imagery to estimate flaring, put the estimate for Russia at 50 billion cubic meters while the official numbers are 15 or 20 billion cubic meters. 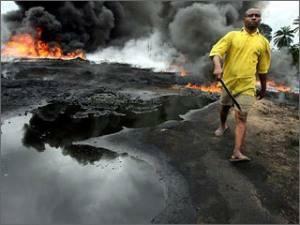 The number for Nigeria is 23 billion cubic meters.